Grazing is the single largest loss factor of marine primary production and thus affects a key transfer rate between global organic and inorganic matter pools. Remarkably, data for herbivorous protist growth and grazing rates at temperatures representative of the vast polar regions and during winter and spring periods are extremely sparse. By combining laboratory experiments with ground truthing fieldwork, this project alleviates a central knowledge gap in oceanography and delivers the empirical measurements necessary to derive algorithms to incorporate temperature dependence of heterotrophic protist growth and grazing rates into biogeochemical models. Large temperature gradients in the global ocean mean that cross-biome and biogeochemical models are particularly sensitive to assumptions about the temperature dependence in modeled rate processes. 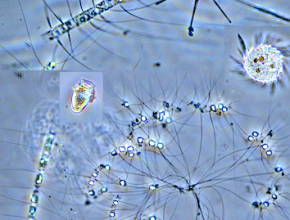 Establishment of the dependence of heterotrophic plankton physiological rates (growth and grazing) to gradients of temperature, mimicking realistic conditions experienced by plankton in a gloabal and dynamic ocean. We are fortunate to collaborate on this grant with the Metcalf Institute for Marine & Environmental Reporting to support their Annual Science Immersion Workshop for Journalists and their ongoing work to disseminate research findings through web-based seminars.